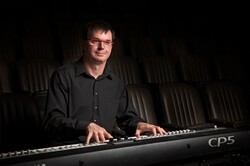 Bruce Petherick is a musician, and a creator of Acoustic Spaces living in Calgary, Canada. He has performed music around the world playing various styles from Classical, Jazz, to Musical Theatre. Having always distrusted the idea of the technical virtuoso, his music has matured into a more subtle, yet still complex style. His music is based on slower pulses but is not restricted to simple harmonic or textual gestures. The first recordings of his Acoustic Spaces were released in 2015, first with 5 Words of Love and now with his most recent recording, Raindrops.